I’m a huge fan of unit conversion tools with a special affinity for Tapbots’ Convertbot on my iPhone. But on the iPad, I’m pretty pleased with Architechies’ Converter for iPad, a tool that makes great use of the iPad’s larger screen and which lets you tap and drag your way to unit conversion nirvana. 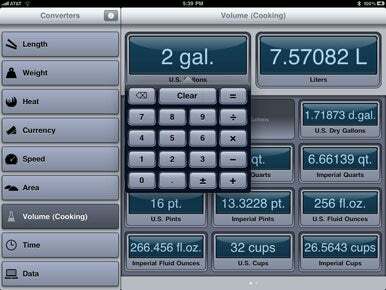 Converter offers nine general unit categories, which include length, weight, heat, currency, speed, area, time, data, and cooking volume. This is far fewer than Convertbot’s more than 20 categories, but what Converter offers is likely to meet the majority of your conversion needs. Numbers Game: Once you’ve dragged a unit into the proper tray in Converter, a tap summons a calculator for the number of units you want converted. The app shows the amount in every unit available in addition to the conversion you’re looking for. When you select a conversion category, you see a collection of available conversion units and two empty trays at the top of the screen. The first tray is meant to hold the unit you want to convert from and the second holds the unit you want to convert to. You have the option of either tapping and dragging available units to the appropriate tray or tapping the unit you want to use and then tapping the tray where you want it to sit. Once a unit is in place, tapping it once brings up a small calculator with which you can enter the number of units you want converted. When you enter a number, Converter displays conversion information in the second tray, but also shows conversion information in every other available unit. The only downside I found was that Converter’s calculator would not accept input from my Bluetooth connected keyboard. While Converter isn’t going to replace my favorite conversion app, the iPad’s large screen and Converter’s thoughtful design make it an excellent tool for at-a-glance unit conversion on your iPad.